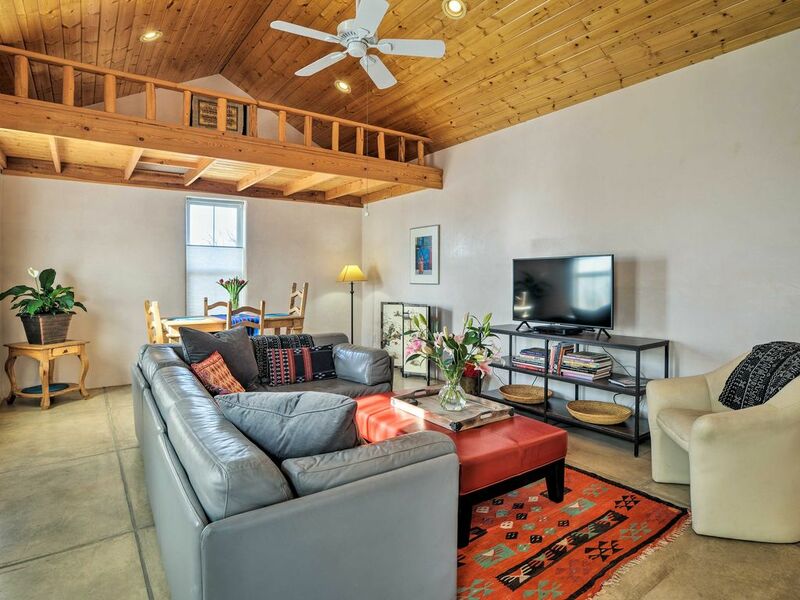 Welcome to 'The Restful Nest,' a charming 1-bedroom, 1-bath Santa Fe vacation rental cottage for 2. Tucked away on a private lane, this home is centrally located just blocks from the Railyard district, Siler/Rufina neighborhood, Frenchy's Field, and more. You'll find all the comforts and amenities you need to settle right in with your travel partner. Look forward to returning to this private haven to unwind in the hot tub after a day filled with exploring, art, adventure, and delicious food! 'The Restful Nest' is a peaceful home base for you and a travel companion to unwind and relax in between your Santa Fe excursions. The living area features high ceilings, a flat-screen cable TV and a comfortable sectional sofa with enough space to stretch out! The floors are scored stained concrete surrounded by traditional diamond finish plaster walls, and a high pitched tongue and groove wood ceiling. A blend of old world and new world contemporary characterizes this space with touches of global textiles the owners have collected on their travels. Every detail is meticulously maintained! When your appetites grow, head into the well-equipped kitchen to whip up a full meal or a savory snack before heading out for the day. Your favorite feature of the home is sure to be the private patio, complete with a hot tub that offers the perfect respite for the end of an adventure-filled day! Ideally located, this home is only 2 miles from the plaza or the Railyard district and 1 mile away to the Siler/Rufina neighborhood of Meow Wolf, local breweries, and restaurants. Santa Fe is a hub for art and culture, brimming with unique local galleries, restaurants, and more. You're sure to find a cool souvenir to bring back home. Frenchy’s Field is right across the street, a favorite park with walking trails and bright sunflowers. Pack a picnic for a sun-filled afternoon before heading home to dinner. "Restful Nest" definitely describes this place. Cozy and private. Beautiful home in a perfect location! The hosts are close by if you need anything but you have a true sense of privacy. Everything in town was only minutes away so the location was perfect! The heated floors and hot tub complimented a relaxing weekend, so we couldn’t be happier with our stay. The small touches they’ve made were wonderful! I’ll definitely book here again whenever I’m in town. Thanks for everything! We would highly recommend the Restful Nest to anyone looking to stay in Santa Fe. It is like staying in a 5-star airbnb! This casita is a gem! It is so quiet and relaxing and is near beautiful walking trails. A new hot tub with spa robes and slippers is a bonus! The casita is decorated in a quiet, tasteful way and has everything one needs for the perfect vacation. Hosts are wonderful : very helpful but totally respect your privacy. The price is very reasonable for all the amenities provided! A real gem!!! Our stay at the Restful Nest was fabulous! The hosts were really kind and showed us how to use the hot tub and whatever else we needed. The space was absolutely perfect for our needs. The casita is beautiful and we loved the location - close to the plaza, Railyard district, Meow Wolf, nature, walking/bike trails, cafes, restaurants and shops and everything we wanted to do. The heated floors were a lovely touch. Would highly recommend to anyone looking to stay in Sante Fe! We can't wait to stay at the Restful Nest again when we return. It is one of our favorites! Wow, this home was fabulous! Sue and George are wonderful hosts who ensure that your trip is memorable. The hot tub was such a plus! The home was spotless, and the extra touches are an added plus. The home is close to all, yet on a quiet street to enjoy your peace. Thanks for such a wonderful accommodation and I am already planning my next visit. I love this place so much. Beautifully appointed and really feels like you're in New Mexico. It's close enough to both the old town/plaza area (boutiques, restaurants, art galleries) and the newer railyard development with REI, movie theaters, bars/restaurants and coffee shops. It was also easy to get out and be around nature (there is a both nice walking trail a few blocks away and access to *nature* nature). I loved the hot tub and the mattress -- both made for an incredibly relaxing stay. The hosts were wonderful and easy to communicate with. I have been coming to Santa Fe for quite some time and will always stay here if it's available. Incredible value for the money -- highly recommended.